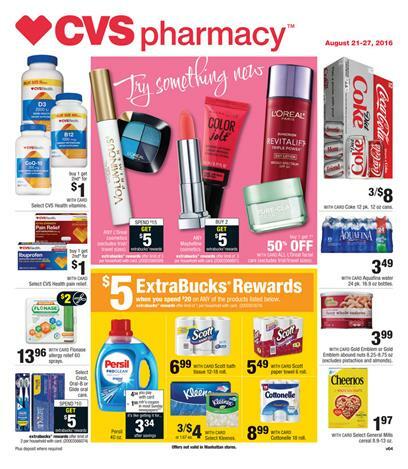 Read the list below for CVS coupon matchups 8/21 - 8/27 2016 ! 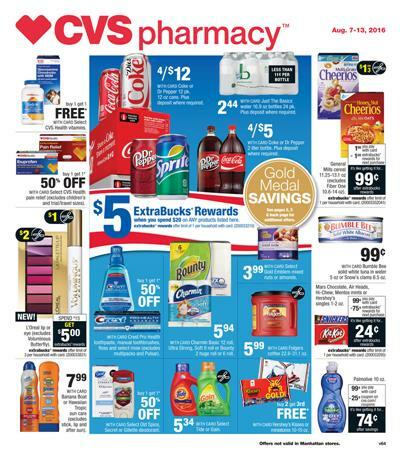 CVS has a great sale this week on many items that are usually higher priced products. Things like Claritin, Prilosec OTC, and RoC facial care are included in the sale and there are coupons out for each of them. Wet ‘N Wild Cosmetics, Osteo Bi Flex, and Right Guard Deodorant are all BOGO this week. It’s a good week to stock up on diapers and cosmetics. There are even free Venus razors in the deal for you. Get them while they last! In the article you may find CVS coupons and links to them. Also browse latest CVS ad. You can find the latest Walgreens Coupons in the list below. Read this post about Walgreens Coupon Matchups 8/21 - 8/27 2016 to reduce your weekly shopping cost. This week feminine care, digestive health, and allergy medication are all on sale with available coupons. You can get a great deal on candy and snack items as well. Olay skin and bath care is offered at 20% off and select brand hair accessories are just $.99 all week long. Nature’s Bounty. Ester-C, Finest Nutrition, and Osteo Bi-Flex are all BOGO so it’s a god week to stock up on vitamins and supplements, too. Don’t forget those in-ad coupons for things like tuna fish and glad plastic wrap. See you there! There are some fabulous deals this week at Publix Coupon Matchup 8/17 - 8/23 2016 ! All of the school supplies are still B1G1 if you have any last minute items that you need to pick up. You can get free mustard if your store doubles and the BOGO sale is fantastic this week. You won’t want to miss this one. Also, don’t forget to check your store’s competitors. Some stores take Target store coupons so you can really maximize your savings using competitors’ coupons. You can also read the latest Publix Ad in this category. Next post will contain the new Publix Weekly Ad. I always keep hot dogs around for those quick dinners and summer BBQs. This week the 15 ounce package of Ball Park Franks is priced at $1.74 and there is a $.55 coupon in the 8/07 Red Plum circular. Use the coupon to snag a package for just $1.19. These are much healthier than hamburger meat and they are already pattied. Jennie-O Turkey Burgers are priced at $4.49 for the 32 ounce package and there are some stackable coupons. There is a printable $1.50 coupon that you can stack with a $1.00 Ibotta offer to get them for just $1.99 this week. My kids absolutely love these in their lunch boxes and they are a healthy snack. The fun Dannon Danimals Squeezables are offered at $1.99 this week as part of the BOGO sale and there is a printable $1.00 coupon that makes them just $.99. Healthy snacks for less than a dollar! Do a dallop of Daisy! The Daisy brand cottage cheese is just $1.49after the BOGO sale and there is a Publix Ecoupon that make sit just $.89. These are not such a healthy snack but they are always a hit and my kids love them. The Totino’s Pizza Rolls are just $2.24 this week and there is a printable $.75 coupon that you can stack with a $.75 off 3 Saving Star offer. Buy three boxes using both discounts and they will be just $1.24 each. If you still have the 6/19 Smart Source laying around you can get a great deal on Mayfield Ice Cream. The 1.5 quart containers are priced at $2.85 this week and there is a $1.00 coupon in the 6/19 Smart Source circular that make sit just $1.89. Here is another yummy snack food on sale. The El Monterey Taquitos are just $3.24 for the bigger 20-24.2 ounce box and there is a printable $.75 coupon that you can use to pick them up for just $2.49 this week. Sargento has a thousand uses in the kitchen and this week it is part of the BOGO sale. It is priced at $1.99 and there is a $.55 Publix Ecoupon that makes it just $1.44 so stock up while you can. Here is another great snack item that you can pick up for pennies on the dollar. BuddyFruit Pure Blended Fruit is just $.50 for the 3.2 ounce container and there is a printable $1.00 off 5 coupon available. Buy five of them using the coupon and they will be just $.30 each. Make breakfast easier with the General Mills Breakfast Packs. They are included in the BOGO sale so they are priced at $2.17 each. There is a $1.00 off 2 coupon in both the 7/24 and 8/07 Smart Source circular that you can use to pick up two boxes for $1.67 each. I use to carry these in my purse for an afternoon snack. The Kellogg’s Nutri-Grain Bars are $1.99 this week and there is a printable $1.00 off 2 coupon that you can use to pick them up for just $1.49 each. If you are a Kelloogg’s Rewards member with 850 points or more, then you can get a $1.00 coupon that makes them just $.99 each. These are hard to keep around once the kids know you have them. The Nabisco Cookies Variety Pack is part of the BOGO sale so they are just $3.24 this week and there is a printable $.75 off 2 coupon that makes them $2.86 each when you buy two. These are delicious little snacks that don’t add to your hips. The Fiber One Cookies are priced at $1.59 this week and there is a $.50 off 2 coupon that makes them just $1.34 each. If your store doubles, then they will be just $.50 each. The Keebler Family Size Cookies and Crackers sure come in handy on many occasions. They are included in the BOGO sale so they are just $2.49 this week and there is a printable $1.00 off 2 coupon that makes them just $1.99. If you’ve got a little one who likes these, then this is the week to stock up. The 4 pack of GoGo Squeeze Apple Sauce is just $1.39 and there is a $1.00 coupon in the 8/07 Smart Source circular. Use the coupon to grab them for just $.39. I use this stuff all of the time. It makes great spaghetti among other things. Barilla Pasta Sauce is priced at $1.39 and there is a printable $.75 coupon that makes them just $.60 per jar. Stock up while you can! Stock up on mustard this week. The 14 ounce bottle of French’s Classic Yellow Mustard is just $.96 and there is a printable $.50 coupon that brings the price down even lower. If your store doubles, it will be free! Here is a good deal on something that tends to be a little pricey. PAM Cooking Spray is priced at $1.44 this week and there is a printable $.30 coupon that makes it just $1.14. If your store doubles, then you can get it for just $.84. If this is on your list, then you are in luck. The 11-12.5 ounce packages of Back to Nature Granola are just $2.09 this week. There is a printable $1.00 coupon that you can use to pick it up for just $1.09. If you like to keep candy around, then here is your deal. Select Hershey’s snack size bags, such as Reese’s Pieces and Kit Kat Minis, are priced at $1.99 this week. There is a $1.00 off 2 coupon in the 8/07 Smart Source circular that makes them just $1.49 each. Here is another one with an older coupon but it’s a great deal if you still have the 6/19 Smart Source circular. Arnold Country or Extra Grainy Bread is on sale for $2.14 and there is a $.55 coupon in that circular. The coupon makes it just $1.59 which is a fabulous price for this bread. I like to keep these around to cut down on dishes on those busy weeknights. The 40-130 count Hefty White Foam Plates is just $2.49 this week. Buy two of them using two printable $1.00 off 2 coupons and they will be just $1.99 each. My dog loves this brand of dog food and this week there is a great offer. The 3.15 pound bags are included in the BOGO sale so they are only $2.24 this week. There is also a printable coupon that you can use to pick a bag up for just $1.24. This is a fabulous stock up price for Pedigree! At just $1.39 you can fit some snacks for the little pooch into the budget. The 7.4-8.4 ounce bags of these Purina Beneful Healthy Smile Dental Dog Snacks are priced at $2.14 this week and there is a printable coupon for $1.00 off 2which makes them just $1.39 each. My little critters just love these things so I will definitely be stocking up this week. The 2.25-3 ounce bags are just $.89 and there is a $.55 coupon in the 7/31 Smart Source circular that makes them just $.34 each. You can beat it unless it’s free. It is very rare that we see produce coupons so here is one for you. I like to keep mangos around because they are good for you and so versatile in the kitchen. They are just $1.00 this week and there is a Checkout 51 offer that makes them $.75 each. If the kids need a change from peanut butter & jelly, then pick them up some lunchmeat. The 7-9 ounce package of Oscar Mayer Deli Fresh Cold Cuts are priced at $3.67 each and there is a printable coupon for $.75 off 2. Buy two of them using this coupon and they will be just $3.29 each. If you do the plant based lifestyle, then here’s your milk. The Silk Nutchello is $3.00 this week and there is a $1.00 coupon in the 7/17 Red Plum circular. Use the coupon to pick yours up for just $2.00. Nabisco Oreo, Newton, or Fudge Cream Cookies are on sale this week for $2.99 and there is a $.75 off 2 coupon in the 8/14 Smart Source that makes them just $2.61 each. Here are some more treats for the lunch boxes! Lance Crackers, Cookies, or Quick Starts are all priced at $2.33 each. Buy two using the $1.00 off 2 coupon in the 7/24 Red Plum circular and you can pick them up for just $1.83 each. These are the perfect healthy option for the lunch box or after school snacks. Believe it or not, I buy them for my husband! The 4 pack of Dole Fruit Cups or Fruitocracy Squeezables are priced at $2.00 this week and there are $1.00 coupons. Depending on which one you want to buy, there is a $1.00 coupon for each one. The printable coupon is for the squeezables and the coupon for the fruit cups can be found in the Smart Source circular. Use the coupon to grab yours for just $1.00. This is a fabulous brand and this stuff works great. 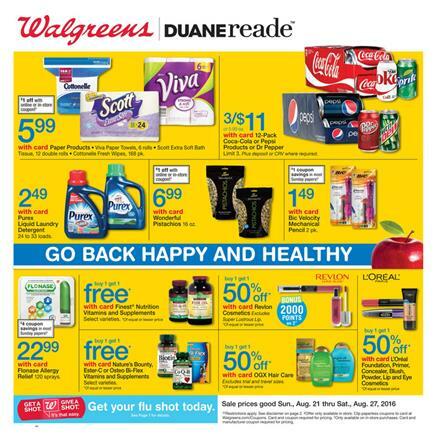 The Neutrogena Oil Free Acne Wash is $4.69 this week and there is a $2.00 off 2 coupon in the 7/24 Red Plum circular. Buy two using the coupon and you’ll pay just $3.69 each. If this is on your list this week, then here is your deal! Select Phillips Digestive Products are priced at $3.99 each and there is a $2.00 coupon in the 7/24 Smart Source circular. Use the coupon to pick yours up for just $1.99. If you love Herbal Essence, then you are going to love this deal. You can stock up this week at just $.50 per bottle. The full sized Shampoo, Conditioner, or Styling Products are just $2.50 each and there is a $4.00 off 2 coupon available. Buy two using the coupon and you can get them for just $.50 each. Here is a great deal on Huggies for you. There is an offer on the diapers and the pull-ups where you get $5.00 off when you buy two of them. There is also a $7.00 off 2 Publix Ecoupon that you can use to pick up two packs for just $12.99 each. If Persil is your go to detergent, then pick it up here. The 100 ounce bottle is $10.99 this week and there is a $2.00 coupon in the 7/24 Red Plum circular. Use the coupon to get it for just $8.99 this week. Whether you prefer Gain or Tide, they are both on sale. The Gain 100 ounce liquid detergent, Gain Flings or Tide Pods 26-35 count are all on sale for $9.99 and there is a $2.00 Publix Ecoupon available. Use the Ecoupon to grab yours for just $7.99 this week. If you use Lysol to clean your commode, then buy it here. The Lysol Toilet Bowl Cleaner is priced at $2.00 this week and there is a $1.00 off 2 coupon in the 7/31 Smart Source circular. Use the coupon to pick up two of them for just $1.50 each. I love these things. I have them everywhere in my house so I’ll definitely be stocking up this week. The Airwick Scented Oil Refills Twin Packs are priced at $3.99 and there is a $1.50 coupon in the 8/07 Smart Source circular that makes them just $1.49. If you need bath tissue this week, then here is the deal for you. Charmin Ultra Soft or Strong Bath Tissue is priced at $9.99 for the 16 double roll package and it is included in the Extra Care Bucks offer. But two of them using the $.25 coupon in the 7/31 PG circular and you’ll pay just $7.24 each after Extra Care Bucks. The 9 ounce bottle of Dawn Dishwashing Detergent is on sale this week for just $.99 and there is a printable $.25 coupon available. Use the coupon to pick it up for just $.74. It is also included in the Extra Care Bucks offer if you want to stack it with some other things to reach your $20.00 price point. Bounty Paper Towels are included in the Extra Care Bucks offer. The 12 roll package is priced at $9.99 each and there is a $.25 coupon in the 7/31 PG circular. Buy two using two coupons and they will be just $7.24 each after Extra Care Bucks. If you are picking up those last minute school supplies, and facial tissue is on the list then grab them here. The Puffs Facial Tissue is being offered at 2 for $3.00 and there is a $.25 coupon in the 7/31 PG circular that you can stack with a $1.00 Checkout 51 offer. Buy two using two coupons and the Checkout 51 offer to pick them up for just $.75 each. Here is a deal on hair color for you. Select varieties of Clairol brand are being offered at 2 for $14.00 this week and there is a $3.00 coupon in the 8/14 PG circular. Buy two using two of these coupons and they will be just $4.00 each. If you are a Tide user, then you are going to love this. The 40 ounce Tide Simply Clean is priced at just $2.94 and there is a $.50 coupon in the 8/14 Red Plum circular that makes it just $2.44. I’ll be stocking up this week for sure. These are great little treats for the lunch box or just to keep around the house. The10-15 ounce Hershey Kisses Miniature or 6.3-11.6 ounce Snack Size are priced at $2.88 with a $1.00 off 2 coupon in the 8/07 Smart Source circular. Use the coupon to pick up a couple of bags for just $2.38 each. Oreo fans can rejoice this week! The 10.1-15.25 ounce package of Oreos is priced at 2 for $6.00 this week and there is a $.75 off 2 coupon in the 8/14 Smart Source circular that lets you pick them up for just $2.62 each. This is the week to stock up on Pampers for sure. The Jumbo Packs are being offered 2 for $17.98 and there is a $2.00 printable coupon available for each package. There is also an additional $1.50 Checkout 51 offer that you can use. Buy two packages using two coupons and the Checkout 51 offer and you’ll pay just $6.24 each. Select Always and Tampax products are being offered 2 for $14.00 so this is the week to stock your cabinets. You can use the $3.00 off 2 coupon in the 8/14 PG circular to get them for just $5.50 each. Oral-B is a great floss and this week it is on sale B1G1 50% off. The 50m roll is priced at $4.39 with a $1.50 off 2 printable coupon available. You can use the coupon to pick up a couple of rolls for just $2.54 each. These are a great pick-me-up in the afternoons. The Larabar Singles are just $1.25 this week. There is a $.50 off 2 coupon in the 7/10 Smart Source circular that you can stack with a $.50 off 2 Saving Star offer to get them for just $.75 each. Here is a deal for all of you L’Oreal girls out there. The Root Cover Up is priced at $10.00 and there is an Extra Care Bucks offer on it. Buy two of them using two printable $3.00 coupons and you’ll pay just $4.50 each after ECB. L’Oreal Lip products are some of the best and if yu haven’t tried them yet, then this is your week. The Colour Rich La Palette Lip is priced at $14.99 with an Extra Care Bucks offer. There is also a $3.00 coupon in the 8/07 Red Plum that you can stack with a $2.00 Ibotta offer. Use them both to pick it up for just $4.99 this week. Here is the stock up price on hair color. L’Oreal Preference or Excellence Hair Color is priced at 2 for $17.00 and it is included in the Extra Care Bucks offer. There is also a printable $3.00 coupon available. Buy two of them using two printable coupons and you’ll pay just $3.00 each after Extra Care Bucks. L’Oreal Advanced Shampoo and Conditioner are both offered 2 for $8.00 this week. There is a $1.00 printable coupon that you can stack with a $1.00 Ibotta offer to bring the price down. Buy two, or one of each, using two printable coupons and the Ibotta offer and they will be just $2.50 each. If you love the Ever Hair Care series then this is the deal for you. The 8.5 ounce bottles are priced at $6.00 each this week and there is a $2.00 coupon in the 7/31 Red Plum circular. You can buy one using this coupon to get it for $4.00 or you can buy three using three coupons to get them for just $2.33 each after Extra Care Bucks. Here is a great deal if you want to stock up on Dove Advanced Hair Care. The full sized bottles are priced at 2 for $10.00 with an Extra Care Bucks offer and a $3.00 off 2 coupon in the 8/07 Red Plum circular. Buy four bottles using two of these coupons and you can take them home for just $2.33 each after Extra Care Bucks. If TreSemme is your brand, then you can get a deal on that, too. The Premium Hair Care line is priced at 2 for $10.00 and it is included in the Extra Care Bucks offer. There is a $4.00 off 2 coupon in the 8/07 Red Plum circular that really helps. You can buy four of them using two of these coupons and they will be just $1.75 each after Extra Care Bucks. Here is another deal on TreSemme. It is very similar to the one above only you are using a $3.00 off 2 coupon and the stylers are included in the offer. Buy four of them using two coupons and they will be just $1.25 each after Extra Care Bucks. If you’ve still got the 6/26 Smart Source circular laying around, then you can get Haagen Dazs for just a dollar. The 14 ounce containers are priced at $2 for $7.00 with a $3.00 Extra Care Bucks offer and a $1.00 coupon in the 6/26 Smart Source. Buy two using two of these coupons and they will be just a dollar each after Extra Care Bucks. This is my daughter’s favorite shampoo and this week I will definitely grab some for free. The full size bottles are priced at $2.99 with a $2.00 Extra Care Bucks offer. Stack that with the $1.00 coupon in the 8/07 Red Plum circular to get it completely free. Stock up while you can! Here is a fabulous offer on Maybelline! The Eye Shadow Singles are priced at $4.99 each and there is an Extra Care Bucks offer when you buy two of them. Use the $1.00 coupon in the 7/31 Red Plum circular and they will be just $1.49 each after Extra Care Bucks. I love using these to remove make up, they just make the process so much easier. The 25 count Garnier Cleansing Towelettes are just $6.49 this week with a $5.00 Extra Care Bucks offer when you buy two of them. Buy two using two $1.00 coupons in the 8/07 Red Plum circular and they will be just $2.99 each after Extra Care Bucks. If this is your brand, then you are going to love this deal. The full size Ultime Hair Care products are priced at $6.99 with a $3.00 Extra Care Bucks offer. There is a $2.00 coupon in the 8/07 Red Plum circular that you can stack with the $2.00 Saving Star offer to get it totally free after Extra Care Bucks. Here is a great deal on some fabulous hair color. The Schwarzkpf Hair Color is priced at $9.99 this week with a $3.00 Extra Care Buck offer. There is also a $3.00 coupon in the 8/07 Red Plum that you can stack with the $3.00 Saving Star offer to pick yours up for just $.99 after Extra Care Bucks. Now that’s a bargain! Free razor anyone?? The Schick Quattro for Women is priced at $10.99 this week and there is an Extra Care Buck offer on it. There is a manufacturer’s $3.00 coupon in the 8/14 Smart Source circular that you can stack with the $4.00 store coupon printing at the CVS Coupon Center to get it for free!! Oral care is in the clouds this week. Colgate Total Mouthwash and Toothpaste are both included in this great Extra Care Bucks offer. The 6 oz tube of Colgate Total Toothpaste is priced at $3.99 with a $1.00 printable coupon. The 1L Rinse is offered for $6.99 with a $2.00 coupon in the 7/24 Smart Source circular. Buy them both using both of these coupons and you’ll pay just $1.49 each after Extra Care Bucks. This is my favorite toothpaste and I will certainly be picking some up this week for just a dollar. The 3-6 ounce tube of Colgate Optic White is priced at $3.99 with a $2.00 Ectra Care Bucks offer. There is also a $1.00 printable coupon that you can use to pick it up for just $.99 after Extra Care Bucks. I like to keep these around the house for guests and sleep overs. The 1 count Colgate Manual Toothbrushes are just $3.49 this week with a $2.00 Extra Care Bucks offer. There is also a $.75 printable coupon that will make it just $.74 after Extra Care Bucks. Zantac is a great product and it really works. Select 20, 24, and 30 count Zantac products are offered at $8.99 this week with a $2.00 Extra Care Bucks offer and a $3.00 coupon in the 7/31 Smart Source circular. Use the coupon to pick yours up for just $3.99 after Extra Care Bucks. Pretty nails for back to school. Sally Hansen Diamond Strength Nail Color is priced at $5.49 with an Extra Care Bucks offer. There is also a $1.00 coupon in the 7/24 Red Plum that you can stack with a $4.00 Saving Star offer to make them just $.74 each after Extra Care Bucks. Stock up on pens even if you don’t need them. The 10 count package of Bic Pens is priced at $1.99 with a $1.40 Extra Care Bucks offer. There is a $1.00 off 2 coupon in the Smart Source circular that makes them just $.09 each after Extra Care Bucks. I have not tried this stuff yet but I have heard great things about it. The 40 ounce Persil Laundry Detergent is offered for $4.94 and there is a $1.00 coupon in the 7/24 Red Plum circular. Pick one up using the coupon and you will pay just $2.94 after the Extra Care Bucks offer. Free Almay Lip Balm!! It is offered for $6.49 and it is B1G1 50% off. Pick up two of them using the $4.00 coupon in the 8/07 Smart Source and the $3.00 store coupon printing at the CVS Coupon Center and they will both be free!! This is also great stuff. The 13-18 ounce Caress Body Wash is priced at $5.99 with a B1G1 free offer. There are also two separate $.75 offers on the Ibotta App. Pick up two of them using two $1.00 coupons in the 8/07 Red Plum and both Ibotta offers to get them for $1.25 each. This is a fabulous price on bath tissue if you need to stock up. The 9 roll Scott Tube Free Tissue is priced at $4.88 this week. There is a $1.00 coupon in the 7/31 Smart Source circular and a $1.00 App only savings offer. Use them both to pick this up for just $2.88 this week. Viva Vantage Paper Towels are priced at just $4.88 this week with a $1.00 coupon in the 7/31 Smart Source circular. There is also a $2.00 off 2 Checkout 51 offer that you can stack with it. Buy two of them using two coupons and Checkout 51 to get them both for $2.88 each. This post contains Walgreens Coupon Matchups 8/14 - 8/20 2016 to let you know about the best deals. Hey Walgreens fans, there are some fabulous deals this week. With the right coupons we can get free Almay Eyeshadow, free Colgate toothpaste, and some fabulous deals on L’Oreal cosmetics. Colgate Toothbrushes and Mouthwash are just a quarter each and there are several in-ad offers that you can use to get the best deals. Our favorite Amope coupons have been reset as well if you missed the last ones. Grab your coupons and your list and get to saving! You can also view latest Walgreens Ad with one click on the image of the cover. Here is a deal on L’Oreal for you. L’Oreal Lip and Eye products are just $6.99 this week with a Balance Rewards offer when you buy two of them. Buy two of the Colour Rich Lip Palettes using two $3.00 manufacturer’s coupons in the 8/07 Red Plum Circular. There are also $1.00 store coupons for L’Oreal products in the same circular and you will need two of those. Stack these coupons with the $2.00 Ibotta offer and you will pay just $1.99 each after Balance Rewards. L’Oreal Paris Visible Lift CC Eye Conealer is priced at $9.99 this week with a Balance Rewards offer when you buy two of them. There is a $2.00 manufacturer’s coupon in the 7/31 Red Plum circular that you can stack with the $1.00 store coupon in the 8/07 Red Plum circular. Buy two CC Eye Concealers using two of each coupons and you’ll pay just $5.99 each after Balance Rewards. Here is a fabulous price on Schick Intuition Razors. They are being offered B1G1 50% off and they are just $11.99 each. There is a $3.00 coupon in the 7/24 Smart Source circular. You can buy two razors using two of these coupons and they will be just $5.99 each. My husband has very sensitive skin and he says this stuff is fantastic. The 3.3 ounce container is priced at $6.79 and there is a B1G1 50% offer on it. Buy two using the $2.00 off 2 printable coupon and you’ll pay just $4.09 each for them. If you need disposable razors for the house grab them here. The 3-12 pack of Schick Disposable Razors is being offered 2 for $14.00 and there is a $3.00 coupon in the 7/24 Smart Source circular. Buy two using two coupons and you can pick them up for just $4.00 each. This is the way to stock up on feminine care products. The 32-36 count box of Tampax Radiant or Pearl Tampons are being offered 2 for $14.00 this week and there is a $3.00 off 2 coupon in the 8/14 PG circular. Buy two boxes using this coupon and you will pay just $4.50 each after Balance Rewards. This is the exact same deal as above only it’s for a different product. If you prefer the pads to the tampons then this is your deal. You can take the big boxes home this week for just $4.50 each after Balance Rewards. If you’ve got a baby at home, then you need Desitin. The 4 ounce tube is $7.49 this week and there is a $1.00 off 2 printable coupon available. Use the coupon to pick up two tubes for $4.99 each after Balance Rewards. The Infant’s Tylenol Oral Suspension is $9.99 this week and there is a $2.50 off 2 coupon in the 7/24 Red Plum circular. Buy two of them using this coupon and you can pick them up for just $6.74 each after Balance Rewards. Free eyeshadow!! This is one of my favorite brands of cosmetics and I use it all the time. The Almay Intense i-Color Everyday Powder Shadow is $5.99 with a Balance Rewards offer and a B1G1 50% offer. Stack those offers with the $4.00 coupon in the 8/07 Smart Source circular and you can get free eyeshadow! Of course, you’ll have to use two coupons. The Neutrogena Oil Free Acne Wash Pink Grapefruit Facial Cleanser is great stuff and it is priced at $8.79 this week with a Balance Rewards offer. Use the $2.00 off 2 coupon in the 7/24 Red Plum circular to nab two of them for just $4.29 each after Balance Rewards. This is my daughters favorite line of hair care and this week it is just 3 for $9.00 with a Balance Rewards offer. Buy three using three $1.00 coupons from the 8/07 Red Plum circular and they will be just $1.00 each after Balance Rewards. I use this stuff and it really works. The 3 ounce tube of Sensodyne True White Toothpaste is $5.99 this week and there is a $1.00 printable coupon available. Buy two tubes using two printable coupons and you’ll pay just $3.99 each after Balance Rewards. If you need this, then you may have cause to celebrate!! The 2 pack of the Early Result Pregnancy Test is offered for $14.49 and there is a $3.00 printable coupon available that will bring the price down to just $9.49 after Balance Rewards. These manual toothbrushes are a great buy. Select Oral-B 3D White Toothbrushes are priced at $4.99 with a $1.50 printable coupon. You can pick them up this week for just $3.49 after your coupon. This is a good week to stock up on diapers if you need them. The 80 count package of Huggies Little Snugglers is priced at $20.99 with a Register Rewards offer. There is also a $2.50 coupon in the 7/24 Smart Source circular. Buy two packages of diapers using two of the $2.50 coupons and you’ll get them for just $13.49 each after Register Rewards. Free Colgate at Walgreens this week. Select Colgate Toothpastes are priced at $3.00 with a $2.50 Register Rewards offer. Use the printable $1.00 coupon to get it completely free after Register Rewards. If you like Olay Body Wash as much as I do, then this is the deal for you. Select Olay Body Wash is priced at $4.99 this week with a Register Rewards offer when you buy three of them. Buy three using three printable $1.00 coupons and you’ll pay just $2.99 each after Register Rewards. Head & Shoulders is a fabulous brand and this week its on sale. The 12.8-13.5 ounce bottles of shampoo or conditioner are both priced at 2 for $10.00 and there is a $3.00 off 2 printable coupon. Buy two using this coupon and they will be just $2.50 each after Register Rewards. This is a great way to stock up for the kids or for company. Select Colgate Toothbrushes or Mouthwash is priced 2 for $6.00 with a Register Reward offer when you buy two of them. There is a $.75 printable coupon that you can use to get them for just a quarter after Register Rewards. Its almost free! Pantene is what we use in my house and I am glad to see it on sale. The full sized bottles are offered at 3 for $12.00 with a Register Reward. Buy three of them using the $2.00 printable coupon and they will be just $2.66 each after Register Rewards. This is a fabulous deal for this cereal. Buy two boxes of the Kashi Cereal, priced at 2 for $5.00, using two of the $1.00 printable coupons and you will pay just $1.50 each for them. These are great just to snack on or to throw in the lunch boxes. The 10 pack of Welch’s Fruit Snacks are offered 2 for $4.00 this week and there is a $1.00 off 2 coupon in the 8/14 Smart Source that makes them just $1.50 each. If you like to keep gum around the house, then here is your sale. The 3 packs of Orbit, Extra, Juicy Fruit, Doublemint or Eclipse Gum are offered 2 for $4.00 this week and there is a $1.00 off 2 coupon in the 7/24 Red Plum circular that makes them just $1.50 each. Here is a great snack for movie night. The 4-8 ounce Pirate’s Booty Popcorn is priced at 2 for $5.00 and there is a printable coupon for $.75 off. Buy two using two coupons and you’ll pay just $1.75 each. These go great in the lunchbox or in the purse for an afternoon pick me up. The Nature Valley Granola Bars are just 2 for $5.00 this week. There is a $.50 off 2 coupon in the 8/07 Smart Source that you can stack with a $.50 off 2 Saving Star offer to get them for just $2.00 each. Select Kellogg’s Cereal is priced at just $1.88 each this week and there is a printable $1.00 off 2 coupon available. Use the coupon to get two boxes for just $1.38 each. If you have had your eye on one of these, then this is the week for you. The Amope Pedi Perfect Electronic File is priced at $36.99 this week. There is a $15.00 manufacturer’s coupon in the 8/14 Smart Source circular that you can stack with the $10.00 store coupon in the August Walgreens Booklet to pay just $11.99 for it. If you color your hair, then you are in luck this week. The Clairol Nice ‘N Easy or Root Touch Up are both priced at 2 for $12.00 and there is a printable $5.00 off 2 coupon that makes the just $3.50 each. If Revlon is your brand, then you can get an even better deal. The Revlon Colorsilk and Colorsilk Luminista Hair Color are both priced 2 for $6.00 and there is a $1.00 off 2 coupon in the 8/14 Smart Source circular. Buy two using this coupon and they will be just $2.50 each. If this is on your list this week, you can get a fabulous deal. The Blink or Blink-N-Clean Drops are priced $5.99. There is a $3.00 manufacturer’s coupon in the 8/14 Red Plum circular that you can stack with the $2.00 store coupon in the Eye & Ear Care Booklet to get them for just $.99 each. If you’ve got to get these this week, then you should grab them here. Select Poise Pads are priced at $11.99 and there are several coupons that you can stack. There is a $2.00 coupon in the 7/31 Smart Source circular that you can stack with a $1.00 store coupon in the Managing Incontinence Booklet. In addition, you can use a $2.00 Ibotta discount. With all three of them you can get yours for just $6.99. Here is a fabulous deal on Depends if you need them or you care for someone who does. Select Packages are priced at $11.99 and there is a $2.00 coupon in the 7/31 Smart Source circular. There is also a $1.00 store coupon in the Managing Incontinence Booklet that you can stack with a $2.00 Ibotta discount. After all three, you will pay just $5.99. Here is your chance to pick up Zantac Duo Fusion for just a fraction of its original price. The 20-30 count bottles are offered for $8.99 this week and there is a $3.00 coupon in the 7/31 Smart Source that you can stack with the $4.00 store coupon in the August Walgreens Booklet. After both coupons you’ll pay just $1.99. We all need those vitamin supplements to stay on the top of our game. Select Centrum and Caltrate Vitamins are priced at $7.99 this week and there is a $2.00 printable coupon available. 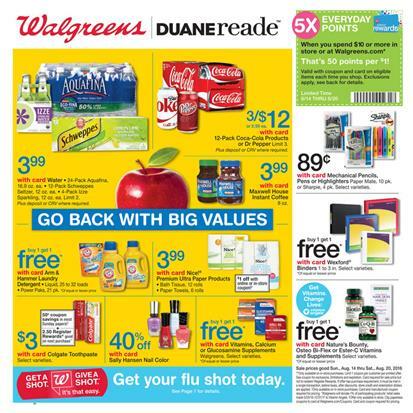 Use that coupon along with the $1.00 store coupon in the August Walgreens Booklet to pick yours up for just $4.99. These are always good to keep around. The Glucerna Advance Nutritional Shakes are $7.99 this week for the 4 pack and there is a $3.00 printable coupon that makes them just $4.99. Here is a fabulous deal on paper products. Whether you need bath tissue or paper towels, they are both on sale. The Nice! Brand Premium Ultra Bath Tissue or Paper Towels are both priced at $3.99 and there is a $1.00 store coupon in the August Walgreens Booklet. Use the coupon to get it for just $2.99. If you prefer Scott Paper Towels, then you are in luck. The 6 roll package is just $4.99 this week. There is a $.65 coupon in the 7/31 Smart Source that you can stack with the $1.00 store coupon in the August Walgreens Booklet to get them for $3.54. This is almost the same deal as above only you are paying for Cottonelle Bath Tissue instead of paper towels. Use both of these coupons to pick up 12 Big Rolls for just $3.49 this week. Here is your cat food deal for the week. The 3.15 pound bag of Meow Mix Dry Cat Food is just $3.99 this week and there is a $1.00 coupon in the 7/31 Smart Source circular that you can use to get it for just $2.99.